The variability of movements that come up in CrossFit programming place unique demands on our thoracic spine. Thoracic mobility is essential for all athletes. At times the spine is asked to act fluidly, in a highly segmental, mobile fashion, and at times it’s asked to lock down in to a rigid plank that can resist bending under very high load. When it comes to our functional health, our thoracic spine sits in it’s rightful place atop the throne. What makes the Thoracic Spine and and Thoracic Mobility so important? Imagine cracking a whip that had duct tape wrapped around the middle of it. The resulting force of the whip crack would be greatly reduced, and the movement of the whip would look inefficient, and downright ugly. 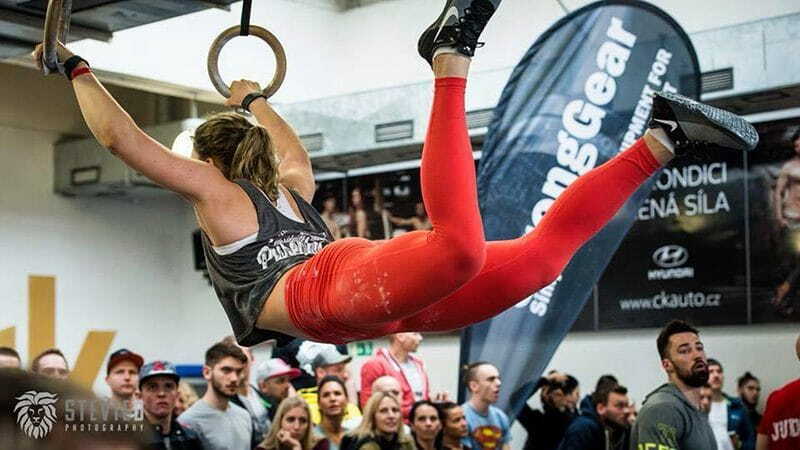 What does that mean for a CrossFit athlete? 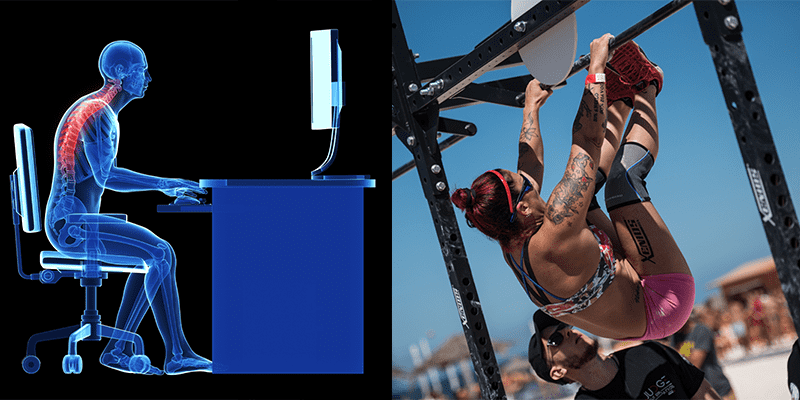 It means less than optimal kipping, more difficult muscle ups, and serious performance leaking. Proper positioning of the thoracic spine is step one for obtaining proper positioning of the shoulder and hip. Proper positioning of the thoracic spine and the attached rib cage relative to the pelvic floor is the key driver for stability throughout the body. The importance of the thoracic spine in this role can not be overstated. 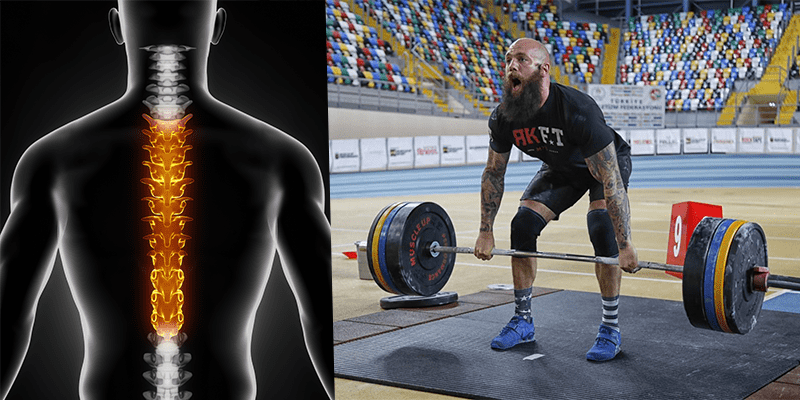 Being stiff or immobile through your ribs and thoracic spine will lead to inefficient and altered stability strategies, that at best will limit your performance, and at worst can lead to injury elsewhere. So hopefully you are convinced of the importance of the thoracic spine in regards to full body, functional health. Now let’s discuss how to fix the immobile thoracic spine. It’s far too common to jump on joint stiffness as the sole driver of thoracic dysfunction. This is not always the case. More commonly, thoracic mobility issues at their root come from years of not utilizing the thoracic spine in all of it’s potential roles. We sit too much, we bend forward, and we perform most of our activity in the direction that our eyes are looking, which is straight ahead. The average person rarely taps in to the posterior, rotational capability of their T spine. The muscles that perform this motion can weaken, gravity begins winning the battle against proper spinal positioning, and the pattern is lost. Once this happens, the brain can begin to view the thoracic spine as one, long segment. It begins functioning more as a rod, rather than as a whip containing multiple segments. That’s when the “stiffness” really sets in. Many athletes may be bringing this stiffness to the gym. It get’s blamed on tight joints, and traditional foam rolling and prayer stretching programs begin. This gives a short term gain in mobility, but all is soon lost. The missing piece is retraining segmental, rotational patterns to begin to rebuild the thoracic spine’s representation in the brain as a highly segmented bone rather than as one long, rigid bone. It is only when the brain makes this representation change that the athlete will be able to access the movement in anything other than a passive foam roller stretch. So how can we develop a more thorough approach that creates long term change. QUICK NOTE: As with all mobility routines the three things you must always consider are: Time, Intention, and Breath. You would never want to mindlessly perform the exercises, but rather spend time with them, focus your attention on the area and goal of the exercise, and use breathing to help accomplish the movement. Use your foam rollers, fancy vibrating mobility balls, etc. Work throughout the T spine focusing on creating motion at all of the segments individually, utilizing your bodyweight and gravity to assist you. Here we will use a breathing exercise to drive flexion in to the thoracic spine. Then we will use a foam roller and side lying exercises to work on extension and rotation. You should spend 3-10 minutes with these exercises. Great now you’ve created a window of several minutes where your range of motion will be improved. You can’t stop there, now we have to work on a segmental, rotational pattern to begin changing the neural representation of the thoracic spine in the brain. This is where rolling and disassociation drills come in to play. This video demonstrates upper body rolling patterns that are great for establishing segmental control. Perform 5-10 reps in the direction of limitation or bilaterally for overall mobility. For the thoracic spine this is not difficult. Moving your bodyweight against gravity is often a sufficient enough load to get the job done. We can get the athlete in to a lumbar locked, child’s pose type position and work on actively rotating the spine against gravity. Cue them to “peel” their body back like they were peeling a stamp off of a piece of paper. You can also grab a partner and have them passively pull you into the fully rotated position, and as they let go you attempt to hold the position. This can be challenging. As you get stronger in this position you can work on exerting force against them at the end range of motion or using a band to resist the pattern.